NEW YORK: To support the Sustainable Development Goals (SDG) defined by the United Nations, the International Institute of Corporate Sustainability and Responsibility (IICSR) in association with Global Impact Alliance organized its first “Sustainability Dialogue” in the USA hosted by Tata Sons. The focus of the roundtable was on the employee engagement and circular economy. A platform for NGOs and Impact investees was provided to present to CSR and Sustainability Heads of Corporations. Sustainability Dialogue event included Ambassador Pradeep Kapur, Smita Siddhanti – President TiE Washington D.C. 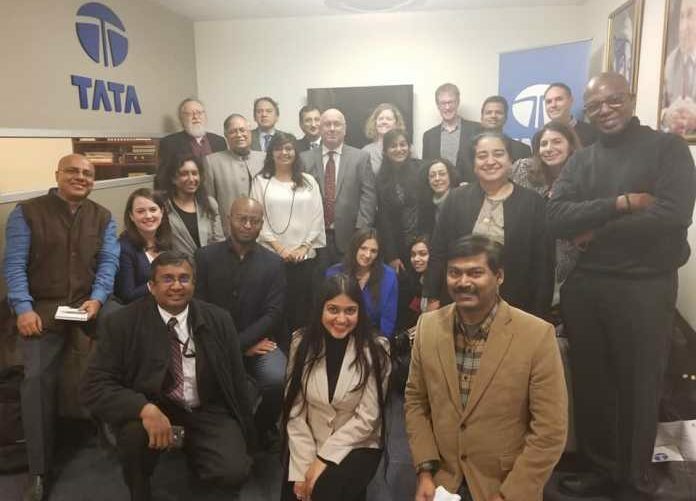 The discussions on employee engagement models were led by Ingrid Embree, Managing Director Global Giving, Sarah Michelecz – North America Head of Tata Sons and Mr. Venkat Kodumudi of CGI Federal Services. It was followed with insights on impact investments by Iliriana K from the Global Impact Alliance and Sustainable development framework to rate corporates and NGOs by Sanjay Vatsa International Advisor to IICSR. Mr. Satish Jha emphasized on UN SDG 4 – ‘Quality Education’ which was implemented by Vidya Bharti Education Trust– the largest private network of schools in India with 17,000 school, 3.5 million children and presence across the villages of India. The UN SDG 3 – ‘Good Health and Well-being’ was also highlighted by him through Boston Center of Excellence for Health and Human Development (BoCE) – a pioneering integrated medicine healthcare organization. BoCE has partnerships with Harvard Medical school and 30 other leading universities including from among the Ivy Leagues. Mr. Harsha Rajasimha, Co-Founder – Organization for Rare Diseases in India (ORDI) continued to emphasize the importance of UN SDG 3. ORDI is working towards making rare diseases as easily diagnosed and treated as common diseases like Diabetes, Hypertension, TB, AIDS etc. Ms. Vigneswari Muthukumaresan, of the Global Impact Alliance (GIA) in the USA touched upon what the new generation is looking for when selecting companies to work with. GIA is a diverse community of social entrepreneurs, impact investors and conscious citizens that advocates innovative and cognizant solutions to achieve the UN SDGs. Ms. Harsha Mukherjee, Managing Director – IICSR, emphasized on SDGs and modes to embed them in Business functions. International Institute of Corporate Sustainability and Responsibility is a USA-based institute to render information, advisory and consultative services on CSR, quality and sustainable development to industry, business and the government. Esteemed Speakers: Harsha Mukherjee, Dwayne Baraka, Sanjay Vatsa, Ambassador Pradeep Kapur, Ingrid Embree – MD Global Giving, Smita Siddhanti – President TiE Boston, Ingrid Embree, Managing Director Global Giving, Sarah Michelecz – North America Head of Tata Sons and Venkat Kodumudi of CGI Federal Services, Harsha Rajasimha, Satish Jha, Vigneswari Muthukumaresan, of the Global Impact Alliance (GIA), Iliriana Kacaniku, Vidyabharti, BoCE, ORDI.